is often applied to those old boilers every time they fire up. But gas, oil and wood boilers need to be maintained and serviced simply because they burn fuel. If the fuel (gas, wood or oil) is not burned properly the unit may still appear to be working but negative by-products are being produced. The most serious of these by-products is the extremely dangerous and odourless gas known as Carbon Monoxide. Particularly if the unit is installed indoors both the boiler and the flue should be routinely inspected and serviced by a licensed gas fitter. Furthermore through incomplete combustion the flue and/or the boiler can become sooted up resulting in reduced efficiency and ultimately higher service and running costs. Whilst the purchase price is paid once, the heating costs are paid every year. If the boiler is quite old it may be reasonable to replace it even though the boiler still works because the running costs would pay the new boiler off within a few years, particularly if it is using on LPG. 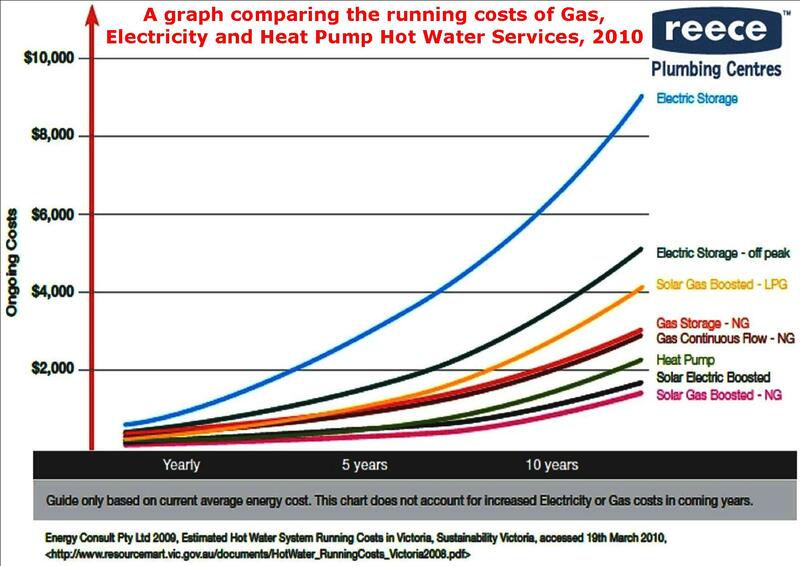 The following graph from Reece's helpful brochure "Hot Water Decisions Guide" shows the ongoing costs of different Hot Water services. In recent years gas boilers have become increasingly sophisticated, whether they be used for hot water, hydronic heating or both. Modern boilers are computer regulated to achieve the highest efficiency. 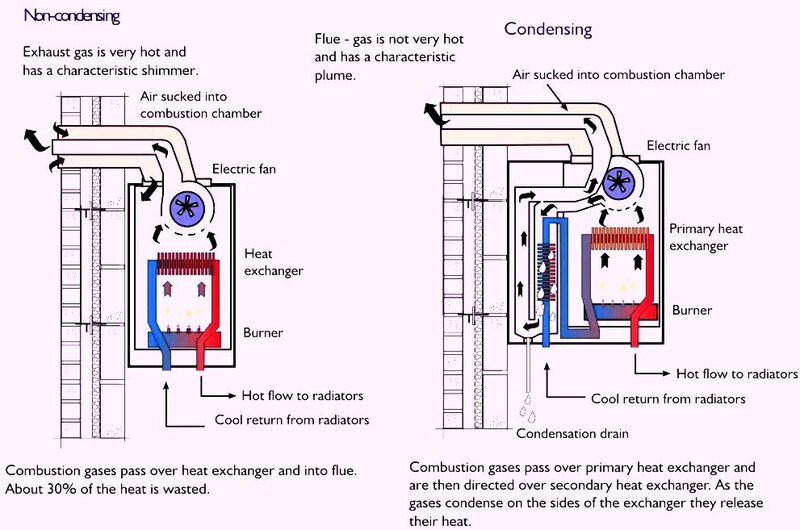 A series of thermostats and thermistors intelligently send information back to the central computer which controls the amount of gas flowing to the burner. In addition many modern continuous flow boilers no longer have pilot flames but are electrically ignited, saving further the cost of burning the pilot flame throughout the year. Some estimate pilot flames to cost roughly $75 per year to keep the pilot flame alight. Modulating boilers generally achieve a 5 star rating. In Australia gas boilers must achieve at least a 5 star energy rating before they are installed in an effort to reduce greenhouse gases. Boiler efficiency is rated by assessing how much of the fuel they consume is converted to a specific temperature. These assessments take place in controlled environments and are expressed as a percentage. High percentages indicate high efficiencies. Boiler efficiency is important to you. Not only does an efficient boiler produce less CO2 but it also consumes less fuel reduce your heating costs. When traditional boilers burn gas they expel flue gases. These flue gases can be between 120 and 200°C. Hence the system is inefficiently ejecting significant heat to the atmosphere. This is wasted energy. Modern condensing boilers have larger heat exchangers or double heat exchangers designed to extract the heat from the hot flue gases. 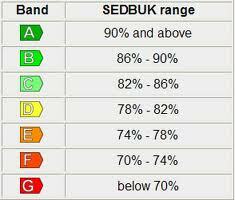 High efficiency or modulating boilers have an percentage rating of >82%, or a Sedbuk rating B whilst Condensing boilers have an efficiency rating of >92% Sedbuk rating A. Older gas appliances fall anywhere between 65<80%. This means that with older boilers anywhere between 35 and 20% of the running cost is wasted. 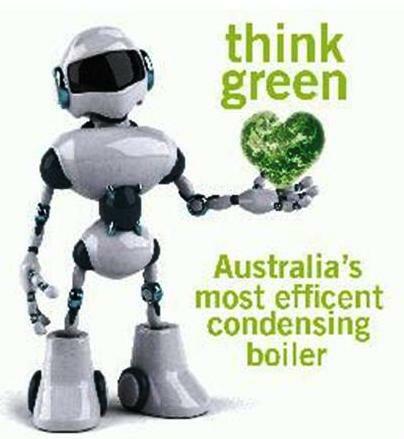 In Australia gas boiler efficiencies receive an energy star rating. A five star rated gas boiler is about equivalent to a B Sedbuk rating and a six star boiler is the same as a Sedbuk rating of A. In many countries in Europe the condensing boiler and of course hydronic heating is compulsory to effectively reduce energy costs and green house gasses. One of the first principles I learnt whilst doing my hydronic heating and plumbing apprenticeship 17 years ago is that fresh air is cheaper to heat than stale air. When people occupy a building that building needs to be ventilated, particularly during the winter when homes tend to be shut up. The reason why buildings need to be ventilated is because people breathe out carbon dioxide, making the air stuffy, or lacking in oxygen. The result can be headaches and drowsiness. Studies have also shown that plants in a building can reduce the level of CO2. People also sweat raising the indoor humidity. If cooking and washing takes place then this raises the humidity even more. Generally a person can produce up to 10L water vapour per day taking the above mentioned activities into account. When the space is heated then the air is able to hold larger amounts of moisture. But once that air cools down that moisture condenses on the cooler surfaces. Once moisture has condensed the surface can absorb that moisture, and over time the home becomes damp. Water vapour always condenses near cold areas such as windows. But other cool areas are places where draughts enter. If this is near the ground for instance where there is carpet, then these damp conditions are ideal for the forming of moulds. Mould spores can trigger off allergies or asthma. The notorious sick building syndrome is attributed to mould growth in hidden, often draughty areas of old buildings where moisture has been allowed to accumulate over many years. These spores, mixed with other germs that people breathe out are circulated around the building through the ductwork. The difference between ventilation and draughts is ventilation is controlled and channelled through dedicated ducting or vents. Draughts are uncontrolled air flow between building elements that should otherwise remain dry. Draught openings are also not cordoned off to prevent vermin and pests from entering. Often when draughts pass through wooden structures the structure can be prone to dry rot which is once again a mould. Placing a hygrometer in the home is a clever way to monitor humidity. About 30% to 60% is normal but if this rises to >70% then action should be taken, sometimes by simply opening a window. If the heating system makes the air too dry then placing a saucer or a small bowl of water near the heat source can help. With the new 6 star housing regulations the building is to be designed with breeze pathways through every habituated room. The following drawing is from Appendix H in the South Australian housing code. Ventilation can only be realized if there are two openings, one for the air to enter and one for the air to escape. Natural ventilation is predominatly used to expel warm stuffy air from a building through convection instead of mechanical ventilation. Convection is simply the natural tendancy of warm air to rise. Therefore when designing natural ventilation one of the ventilation openings is usually situated in the ceiling or a raised roof space to capture the risen warm air. The other opening(s) are placed low down the wall preferably at floor level. The coolest air is close to the slab and the warmest air is close to the ceiling. If an indoor gas appliance draws its air from the area wherin it is installed natural ventilation is always required The size of the openings are calculated according to the size of the gas unit. Therefore ventilation openings should NEVER be blocked off to prevent draughting, particularly if gas appliances have been installed in the vacinity. One could rather seek professional advice from a licenced gas fitter if the openings might be moved in an area housing a gas appliance. Appendix H in the South Australian housing code. © Adelaide Hydronic Heating. All rights reserved. Design by NodeThirtyThree.